8.81 points at 77 votes (rank 5). The light and the dark side (or the eternal confrontation). A magical, mediaeval field depicted as an overgrown chess board becomes apparent in front of you. Inside this mystical area there are mythical creatures as e.g. unicorns, sorceresses, golems, wizards or fire-breathing dragons. If one of those creatures moves to another field, so its life energy changes depending on the colour of the field. If two opponents meet on one square, the playing field turns into an arena. Your characters use their fantastic abilities to fight against banshees, goblins and wizards. They use spells, missiles and fists, they throw spears and fire. They even take over the look and the characteristics of the opponent. You will need all your skill, agility and intelligence to control and lead your side. Your magic rises and diminuishes with the light cycle of the board. The same way the light changes, so your abilities change. You need to keep an eye on the time and portion your strength effectively. Archon is a fight made of action and strategy, which is carried out between two oppositional armed forces, that consist of myths and legends. The light and the dark side consist of the same number of individuals and their strengths are roughly equal, but they are not made up of the same troup parts. Their goals are the same: every side exists to win. Either by destroying all the opposing armed forces or by conquering the five force fields. 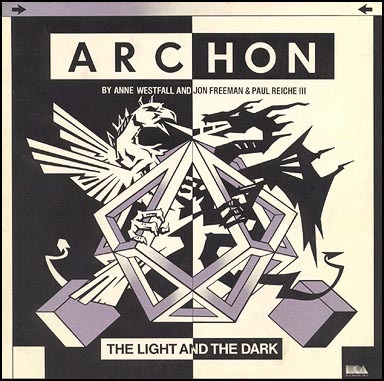 Archon - The Light and the Dark looks like a chess game with nine to nine fields and fantasy figures, which carry the names of mythical creatures. The aim of the game is to completely destroy the enemy or to occupy all force fields. In difference to a chess game not only brains are important but also skill. Antagonistic figures cannot be beaten, only challenged for a duel, which is carried out on a seperate field. Both parties do not have the same characters, but throughout different ones, whereas the fighting strength is approximately balanced. The fighting strength of the figures is not constant. It is lower after a fight with many hits and on fields of the opposing colour. The game area contains three different types of fields; the third type changes the colour after every round. On these fields the dark party gets stronger, when the fields are coloured dark and vice versa. The characters are partially hard to distinguish from each other, otherwise the game area has good graphics. The area for the duels uses the whole screen, here the figures are better to distinguish. The operation of the figures is done with the joystick and is easy to learn. You can play against the computer or a human partner. 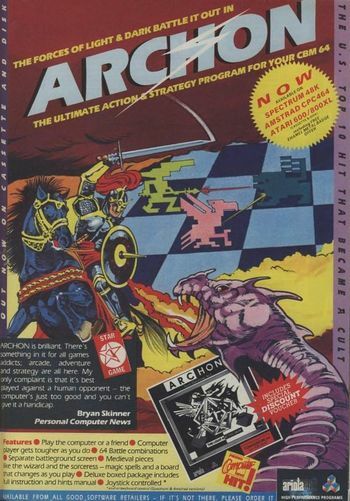 For beginners Archon is first of all less a strategic game, as he will lose duels against the computer or a trained partner even with distinctly superior figures. The different fantastic characters under your command are represented by specific images "icons" - stilized pictures of knights, goblins, etc. There are 20 icons on the board, 8 different ones on each side. Additionally there are 4 elemental powers (more about them later). None of your characters is identical to one of the opposing side. 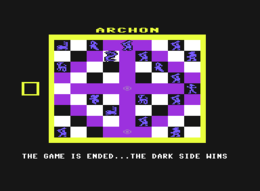 Archon is played on two screens. On one - the strategic screen - you and your opponent try to manouvre their characters by moves in turns into good positions. If you move your character to a square that is already occupied by an opponent character there will be a switch to the second screen, which depicts the arena. Out of old tradition the "defenders" in board games (chess, backgammon, etc.) are beat directly, i.e. they are removed from the board when the "attacker" wins the "fight" about the position. In Archon we do not allow such a lemming-like docility from the defender! If you want to conquer a position that is occupied by an opponent you have to fight for it. The square that is fought for is enlarged until it fills the screen and then you can hear with the words of a certain orange monster from the comic area, "It's clobberin' time!!!" 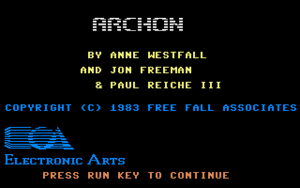 Archon's strategy screen is subject to constant changes. While some squares always stay white or black, change others, so-called light squares, their brightness. The course of this change is the following: black, dark (blue), rather dark (violett), rather bright (green), bright (turquoise), white and back again. This change happens after every move. Your game strength rises and falls with the light cycle, as characters of the light side are harder to beat on the bright squares than on the dark ones. Consequently, the characters from the dark side are harder to beat on the dark squares. The five force fields are shown by red, flashing symbols on the board. Characters that occupy a force field heal faster than usual and are protected from effects of magic spells. When your characters occupy all five force fields, you have won the game. When the oscillating frame is on your side, it is your turn. Use the joystick to move the frame to the desired character. Press fire to "pick it up". Now you need to make a move with this character (if no move is possible with a character, you cannot "pick" it). After moving your character to the destination, press fire again to put it down. Moving is done in three different ways: on the ground, in the air, through teleportation. 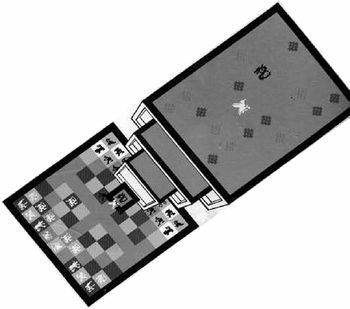 Characters that move on the floor cannot move over occupied squares. Chracters that move in the air are only limited in the choice of the destination square. Furthermore they can also move diagonally, characters moving on the floor can't do that. Only wizard and sorceress can teleport, but practically you can imagine them as characters which move in the air. With every move you can move a chracter in every direction or combination of direction up to its allowed distance as long as the end square is not occupied with an own character. Note: If you, while moving a ground character, change your mind and want to set it to another place, you have to move it back to the starting point the way you came first, because else the computer presumes that you want to try to prolong your move illegitimately. All things happening in the arena are direct and simultaneous; here there are no moves. You guide you character directly through the joystick. Pressing fire releases an attack - e.g. swaying the sword or shooting an arrow - into the direction the joystick points at. An attack can be done into all 8 directions. IMPORTANT: Your character cannot be moved while the fire button is pressed. There are three basic fighting types: Knights and Goblins are sword and club swayers, they need to go close to the opponent to cause any damage. Banshee and Phoenix cause damage in a circle shaped area around themselves, the longer an opposing chracter remains in this area, the more damage is caused. During such "area attacks" you do not need to aim. All other chracters "throw" weapons of all sorts and types, which can cause damage up to a considerable distance. During the fight your character cannot carry out the attacks as quickly as you could press your button. It takes a moment until a sword is brought to a position for attacking, some time longer to conjure a fire ball and full 2 seconds to loosen a piece of stone from the floor and get into the position for throwing. If you press the fire button before your character is ready for the attack, this will only provoke a motionlessness of the character. The exact point of time, when your character is ready can carry our another attack, is marked by the computer through a bell-like sound. A high one for the light side and a low one for the dark side. The obstacles or barriers in the arena have their own light cycle. Be careful, these barriers are a tricky issue. A barrier is normally impermeable, but if the cycle makes it change the colour and its colour then corresponds to the one of the background, it will disappear... for a few seconds. During this time it is practically not there and therefore doesn't function as an obstacle for characters and missiles. Furthermore can the barrier be pervaded by missiles and characters a few seconds before it disappeared and after it has reappeared. However, the speed of the pervading matter is reduced. Basically you can say that the more solid a barrier looks, the less pervasive it is. If you are in doubt about a barrier, then just avoid it. The two lines on both sides of the arena represent the current health of the two fighting characters. If a character is wounded, the corresponding line will be shortened by a part that is adapted to the size of the wound. If the lenght of the line has sunk to zero, the related character is "dead" and the fight ends. A victorious character returns to the strategy screen and occupies the hard-fought field. However, a seriously injured character is easier to defeat in the next fight. Even the strongest character can get "exhausted" by repeated fights. On the strategy screen wounded characters are healed slowly by the passing time, faster by occupying a force field and right away and completely when using a heal spell. Magic is the most important strategic element in Archon. Only two characters, in the following named "magical characters", - the Wizard and the Sorceress - can cast magic spells. And every magical character can use each of the spells only once. But these magical spells have a catch: every spell weakens the character that casts it. When using this ability often this character will be worse in defending itself against a direct attack. A spell is cast on the strategy screen instead of a regular move. Point the frame to your character that is supposed to cast the spell and press fire (the usual message appears). Without moving the character press the button again and the new message "select your spell" appears. Now move the joystick forwards or backwards to view the available spells. When you have found the desired spell, press fire to apply it. If further actions are needed from you, then continuative messages will appear and inform you properly. Note that you can use each spell only once and no spell can be cast against a character that occupies a force field. Effect: This spell moves (teleports) one of your characters for any distance from one field to another on the strategy screen. Necessary steps: After you have chosen this spell, move the frame to the desired character, press fire and then move the character to the target field as with a normal move. Restrictions: You cannot move opposing characters. You cannot move to a field that is occupied with an own character. You cannot teleport from a force field. You cannot teleport imprisoned characters. Additional note: Do not mistake this spell for the normal 3-squares move of a character that can cast spells. The 3-squares move is a "small spell" which is on the same level as "throwing fireballs" and is not tied to the restrictions of the seven magic spells. Effect: This spell heals any of the own characters completely. Necessary steps: After you have chosen this spell, move the frame to the desired character and press fire. Restrictions: You cannot heal a character that is positioned on a force field. You cannot heal a completely healthy character (what for anyway?). Effects: Two effects are possible. Most of the time the spell will reverse the time stream: e.g. the direction of the light cycle of the light fields; squares that got darker now get brighter and vice versa. But if the spell is used at the point of time when the cycle is exactly at the reversal point, then the state of the cycle will exactly be turned into the opposite. 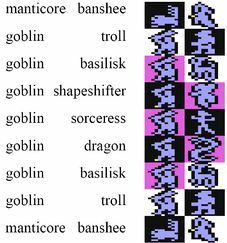 Effect: This spell swaps the positions of two characters on the strategic screen. Necessary steps: Move the frame to one of the characters you want to swap and press the fire button, then position the frame to the second character and press fire again. Restrictions: None of the two characters can be placed on a force field. Effect: This spell allows you to attack an opposing character with a new, short-term available character that represents one of the four elemental powers (earth, wind, fire, water). The confrontation is carried out as usual in the arena, but this character will lose its existence after the fight (no matter if won or lost). Necessary steps: As soon as the spell has been chosen and the character appeears on your side of the strategy screen, move it to the character you want to attack. In the arena you move your "elemental character" as usual. Restrictions: A character that occupies a force field cannot be attacked. You cannot move with the "elemental character" onto a free square or a square with your own character. You cannot choose which of the four "elemental characters" appears to your call. Effect: This spell restores a character that has been lost in a fight. Necessary steps: Move the frame to the character to be restored, press fire and move the character to a target field as in a normal move. Note, that the starting square is placed in an own display next to the strategy screen. The target square must be an unocuppied square next to your "magical character" (Wizard/Sorceress). Restrictions: You cannot revive a character that is not lost. One of the five squares that adjoin the "magical character" in the basic setting needs to be free and you need to move the revived character to one of those fields. Effect: This spell bars a character from leaving a square of the strategy screen. The character can defend itself against attackers (in the arena), but cannot be moved on the strategy screen. IMPORTANT: an imprisoned "magical character" cannot cast any spells! An imprisonment is temporary, a character from the dark side is freed as soon as the light cycle of the squares changes to dark and vice versa. Necessary steps: After this spell was released move the frame to the target character and press the fire button. Restrictions: You cannot imprison a character that is standing on a force field. You cannot imprison a character at a point of time, when the light cycle would free it automatically. This is not a spell, it is a way to leave this menu. If you change your mind or the desired spell is not available, press fire when "cease conjuring" is displayed. A very old man, who juggles with supernatural powers, the wizard is the leader of the light side. In a fight it throws destructive fireballs. It seldom takes the risk to leave its force field, as it usually uses one of the seven magical spells. sorceress It resembles the wizard only in strength, apart from that the eternal young and pretty sorceress is exactly the counterpart. Its light beams are faster than the wizards fireballs, but a bit weaker. Boisterous in the fight, but safest on its black force field, where it is most of the time used to cast spells. unicorn Resembles a big white horse with a lions tail and a sharp, spiral horn on its forehead. The unicorn is quick and agile. This wonderful creature can fire a glaring energy bolt from its magical horn. basilisk The basilisk is a small reptile with the scabby body of a lizard. Although it is comparatively short-lived, its quick moves and deadly gaze make it a serious opponent. archer The archers are fearless amazones, that can handle their bows with legendary skill. They are equipped with magical quivers that never get empty. manticore The manticore resembles a big golden lion with a humanoid face and a tail similar to the one of a scorpion. This disgusting thing teems with big spikes which it can shoot with surprising precision. golem A golem is an artificial creature, formed out of stone and gleaming metal and brought to life by magic. The shape is roughly based on a human but well twice as big. Its weapons are stone chippings which it throws with destructive power. troll An inhabitant of caves and dark places. The deformed troll is a "waggly" giant, dull but strong, clumsy but very tough. Like the golem it doesn't carry any weapons but grabs rocks, tree stumps and whatever it gets into its hands and throws these massive items onto its enemies. valkyries are pretty, blonde warriors of the legion of Valhalla. Every one of it is equipped with two big talents: firstly the ability to walk through the air as if it was solid ground; and secondly a bewitched spear that after been thrown returns to its thrower. banshee The banshee is an immaterialized undead that can deprive the enemies that are in its reach (the shaded area around it) of their soul with its keen. djinni The djinni is a magical creature from another dimension, a flying thing from tempest and storm in the shape of a big and enormously muscular man whose body seems to be partially solid and partially turbulenced air. As cousin of the wind the djinni can rouse a small tornado with a gesture and control it with its thoughts. shapeshifter The shapeshifter is a so-called "look-alike", a demoniac creature without true form or shape. During a fight it turns into the reflection of its opponent, strongest at skills at which the enemy is weakest. It has no fixed life span; all wounds will heal as soon as it adopts a new shape. phoenix The phoenix is a burning bird with immense size and power. In a fight it can explode in a boiling mass of fire that scorches everything in its radius and burns every opponent that was uncareful enough to come near the white glowing core. The phoenix is not only immune against its own fire but it can also - during its metamorphose - not be hurt by any known attack. dragon The dragon, a monstrous reptile, is virtually without opponent in the arena. One wave of ember of its feverent breath already kills many creatures, the second one is defintely deadly. It is very movable and very hard to kill, its value is only outranged by the sorceress. knights The knights are soldiers going on foot that are armed and primed against enemies that are much bigger than they are. Although they cannot withstand more than one attack from many of their enemies, they are no cannon (or dragon) fodder. Provided that they are fast and intelligent their speed of their attacks gives them the chance to survive and to triumph. goblins Goblins are ugly dwarfs with bad nature, unfriendly and often boisterous. Their enemies only hold them at bay on the squares of the sorceress. On the dark squares their gnarled clubs are more than up to the swords of the knights and if they are played well, they can also win against stronger enemies. 1. Conservative opening For this you move your unfavourably placed characters to squares that are better for their colour. (White squares for light side and vice versa). The primary aim is to reach a strong balanced position as early as possible. The characters in the corner (valkyrie/banshee) are agile but especially vulnerable against magic spells (e.g. summon elemental or teleport), that's why these should start. 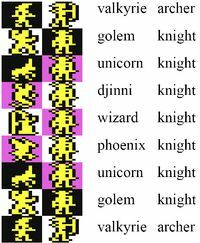 As the basilisk/unicorn are characters that move on the ground they "stick" on the "wrong" square until you clear the way for them, either by directly moving a knight/goblin in front of them or moving adjacent characters onto other squares. 2. Magical storm The aim is to destroy the strongest opposing character before it can do any harm. Most of the times this is easy to do with a combination of spells: imprison, summon elemental, teleport, and if needed, shift time. The first spell makes the victim unable to move, while you attack with an elemental. Then you teleport one of your strongest characters over the strategy screen. Shift time can be used to aviod that the imprisonment of the character is ceased before you defeated it. 3. Monster tussle This is risky but entertaining and sometimes astonishingly effective. Just fly or teleport on of your characters (the djinni/dragon or phoeix/shapeshifter) to the other side of the strategy screen and take them for a "tidy up-tour" on the occupied squares (normally this is quite unfavourable for the characters placed there). This scene mostly creates a tendency for panic wiht new playery, which is always an advantage. Experienced players will imprison the attacker or start a counterattack tidy up. A quick reduction of the value on both sides follows a counterattack. Stay on your colour! The effect of the square light onto the life energy of your characters is partially more than 50%. Only attack on infavourable squares if you largely outmatch the defending character. Plan ahead, most of the successful attacks need more than one move for their realization. Before you attack a square think about the following: what character completes the attack, when the first attacker gets killed? Avoid locking your own characters. Open the front row of characters to let pass characters of the back row that move on the floor. The higher the mobility of your force is, the bigger is your flexibility and strength. Protect your wizard (sorceress)! It might be a superior character in the arena but when you lose it early in the game you will lose it all with a high probability. As you are safe from magical spells on force fields, it is a wise decision to leave the wizard (sorceress) "at home". Teleport A useful spell to place a slow or infavourably placed character to the back row of your opponent. Heal Never heal a shapeshifter! It regenerates completely between fights. The spell would be wasted. Shift time Use this spell to elongate an imnprisonment but reverting the time flow bevor the tip of the light cycle is reached and the opponent is freed. You can also use this spell to free an own imprisoned character, if you use it when the light force has reached the opposing climax. The cycle will jump to the climax of your colour and your character will be free. A more strategic use of this spell is to start a massive attack on the force fields and to possibly win while keeping the light cycle favourable for your purpose. Exchange An opposing advance can be thwarted at short notice, by exchanging a dangerous intruder (e.g. an opposing dragon/djinni) in your area by a weaker character from the oppsing area. Summon elemental This character is neutral is therefore not influenced by the effects of the light cycle. They are suited for attacking a disturbing opposing character that is occupying a advantageous square. This spell is also very useful against the opposing wizard (sorceress) that has left its force field. Revive Only revive strong characters. Avoid placing a revived character on an unfavourable square as it might quickly meet its maker again. Imprison The true trick with this spell is the timing, combined with Shift-Time, if necessary, to elongate the effect. Imprison a threatening invader to weaken its attack or stick a strong opposing character onto a square and attack it, when the light cycle is most favourable for you. Don't move in straight lines, change the direction abruptly, don't get predictable. Shoot and run. Don't shoot and wait for a strike-back. Instantly take your finger of the fire button after a shot and make sure you leave the place! If you hit something it can also hit you. Use diagonal shots! Although they are harder to do, 45 degree shots improve your performance considerably. Allure your enemies into a corner. This is especially helpful for characters with slow missiles that can easily be avoided and of course for characters with a short reach (knights/goblins). Do feint! Mock an attack and when the enemy is misled to make an attack, then do an attack yourself during its cease fire. Confuse your opponent. If you are in short distance to it, back off so not to get nailed down. This is especially important when you cannot afford an "exchange of fire". This is also a good strategy for knights/goblins. Keep the strengths and weaknesses of your characters in mind. Different characters also need different tactics - sometimes utterly different tactics - and the type of the opposing character should also go into your considerations. Wizard Avoid using the wizard as long as it is not attacked, in the arena. During a fight stay at medium-long distance an on open terrain; fireballs can be easily stopped by barriers. Sorceress Same with the wizard you should avoid a direct fight! The speed of its light beams allows it the most effective actions from big distances. Stay defensive and use barriers to get some space between it and the enemy. Unicorn/Basilisk Speed and distance are their primary weapons. Never get to close to the enemy, especially if the opponent is standing free, try to use rows of barriers as a help for aiming. Archer The arrow of an archer is not very fast so the shooting distance to get a hit is in the closer area. Slow enemies also allow bigger shooting distances. Golem/Troll The advantage of this slow-moving characters is in their long life span and their deadly attacks. (Rocks hurt enemies enormously!) As the rocks roll slowly you need to bring the golem/troll close to the opponent, wherefore an aggressive play is needed. Djinni/Dragon They have enough power, don't have reservations during an attack. Avoid potential meanders on craggy terrain, if the enemy possesses a quick attack. Valkyrie The valkyrie is basically a more tenacious archer with a slower but stronger attack, use the same tactics. Phoenix In a fight close to the enemy - the closer the better. Try to force fast enemies into a corner. Use the explosive attack for defense if it should be necessary to protect yourself from a hit. Never stay in one place as long as you are vulnerable. Shapeshifter The success of this character is very much dependent on the adequate fighting place. Avoid the white squares like the plague! Ignore the knights (why should you take the risk of loosing this character for such a low price?). Attack strong characters on black or dark squares. Manticore This beast has the advantage of a "wider" attack, especially in the diagonals, as the opponent. But stay in mid-long distance to the enemy if it is stronger. Banshee The banshee expects - and awards - great skill. It is worth the additional effort. Stay out of the fireline until the moment of attack; then you arrive from the side, here the effect is the greatest. Press fire on the joystick, let got right away and follow the enemy as close as possible to expose it to the scream. Avoid the golem (also known as "the banshee's curse"). Knight/Goblin If you let these close combat fighters hesitate, they are dog food. Move them fast but unpredictably in direct vicinity to the enemy and stay there! Jump forwards and backwards or orbit the opponent to avoid getting hit and attack nonstop. In a fight knight againgst goblin try feints, only accept a constant exchange of blows if you own a striking advantage through the light cycle. Elementals The four elemental powers are utterly different. The elemental power of earth is played as a golem/troll, which is for the most part similar to it. For the other three: fire has the quickest and most harming attack, water the longest life span. For choosing the tactics you can imagine the element fire as a wizard, the element air as an archer and the element water as a manticore. No matter which element you use, fight aggressively with it! Consider that the state of health is irrelevant, as after the fight the element will in no case be available any more. Sledgie: "The game is lots of fun. The combination of skill and tactis provides a high attraction." Worf: "Great game, 1A, in my personal top 5 of computer games! 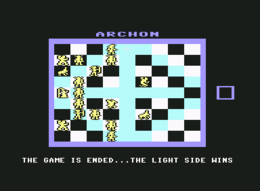 Archon is a chess clone of a special kind. Black fights against White, Dark against Evil, depending on the time the one or the other side has more power. Figures not just get beaten, but an arena opens up, in which both figures compete against each other. You can win the game by beating all opposing figures or by occupying all power magic points. The main figure, the sorcerer, has particularly many abilities. If you don't know it, you've missed a thing. It is best playes at the real C64 with two players." Tulan: "One of the best C64 games ever, rank 2 after Giana Sisters in my personal C64 charts :)." I played this game on the original C64 and now I continue playing it on the PC with the CCS64. My tip: Connect the PC to a beamer and arrange a championship with your friends. A game with a similar fun factor is in my opinion "Super Dog Fight"
STRATAK: Smashing game - on the amiga there was a nicer version and the figures were also better to recognize. By the way I like it better than Archon II. Shakermaker303: "One more great game by Electronic Arts. How we laughed and were annoyed, when the supposedly weaker enemy with a club had run behind the quick shooter and had managed to beat it up. Great fun factor, I like playing it again and again. 10 Points!" This page was last modified on 3 December 2017, at 16:24.